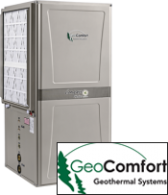 GeoComfortGeothermalsystemsarebuiltintheheartofAmerica withstringentquality controlsystems and themostcomprehensivetestingwithinthegeothermalheatingand coolingindustry, available in the North Iowaand Central Iowa areas. Attractive color and design with attention to detail. Nearly airtight seal delivering positive effect on your air quality. Innovative engineering to assure extremely high heating and cooling efficiencies. All aluminum micro channel air coil eliminating corrison and delivers longer life. Mort’s Plumbing and Heating and Geothermal serve geothermal customers from three Iowa locations; Iowa Falls, Iowa, Webster City, Iowa and Latimer, Iowa.